Combine 1/2 cup jam, 2 tablespoons rum, 1 tablespoon oil, mustard and garlic; spread over pork tenderloin. Place tenderloin in prepared pan and roast 20-25 minutes, until meat thermometer interted reads 155 degrees F.
Let tenderloin stand 5 minutes before slicing diagonally into 1/4-inch slices. Meanwhile, heat remaining tablespoon oil in large skillet over medium-high heat. Saute onions about 5minutes, stirring, until soft. Stir in remaining jam, rum and chipolte peppers. Reduce heat to medium. Cook, uncovered, 10 minutes or until slightly caramelized, stirring occasionally. Salt and pepper to taste. 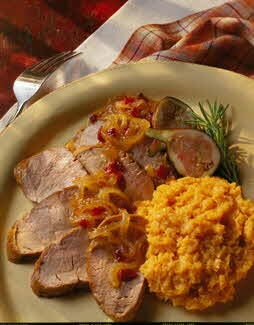 Serve sliced pork with onion mixture. Sprinkle red peppers over both. Garnish platter with fresh sliced figs, if desired. *Always wear rubber gloves when handling hot chiles. Quick and easy to prepare, makes this healthy dish a great for special occasions. Some markets it is easier to find fresh figs. Serve with mashed sweet potatoes and asparagus.